Critical psychiatry: I'm not an anti-psychiatrist, or am I? It seems the hubris of left-wing psychiatrists who coined the term 'anti-psychiatry' led to it becoming a backlash term of abuse to dismiss any critics of psychiatry, as Szasz has pointed out. But Szasz himself seems to be an extremist libertarian moralising capitalist and scientology ally. The critical psychiatry term seems most useful for academic identity purposes. Szasz himself seems to be an extremist libertarian moralising capitalist and scientology ally. Couldn't agree more, but he's fawned over by the equally fundamentalist sections of the "recovery movement"
Duncan,your opening diagram completely misrepresents the position of Thomas Szasz. Are you familiar with his work? I notice that none of his books are on your recommended reading list. The 'anonymous' comments also show a similar ignorance. Dr Szasz may be a libertarian but to call this view 'extremist' is not only wrong but reveals your 'moral' standpoint. Szasz is also a secular humanist and has never in his work shown any support for scientology. Your claims are therefore the product of your imagination and not factual. Not sure how I've misrepresented Szasz, anonymous, by saying that he does not think that mental illness exists. I do think Szasz has contributed to critical psychiatry in its widest sense, but I don't always agree with him (eg. see previous post). I'm the 2nd anonymous and my view is not in my imagination nor ignorant and you [no 3] are 'anonymous' as well. He features on a film by scientologists holding psychiatry wholly responsible for the Holocaust, and anything else they can squeeze in. His face on that film and support for it isn't imaginary. Szasz has openly and rudely shouted down people who have been through the psychiatric system at public events. His refusal to engage in debate with them wasn't in their imagination. He's the one who makes 'moral' statements such as telling a telling a highly respected survivor academic that they were a "malingerer" because despite their achievements and employment still experienced periods of distress and took professional support. The right wing view is extremist because it dictates that taking state support is somehow weak and that 'personal responsibility' would mean not taking it. Real life isn't quite that simple. When I referred to fundamentalism I was referring to the fact that certain brands of recovery worship at his feet because he supports people sinking or swimming and the withdrawal of state support. He is blind to the fact that the western world remains medical model and that ALL state health and social support demands a medical or psychiatric definition in order to access it. The voluntary and independent sectors cannot provide that support such as social housing and we are probably decades away from being at the point where people can access emotional, financial, practical and housing help without it. I wish it were different. I get fed up of Szasz being held as a great icon of the "recovery movement" because it fits in with the don't take support/meds/benefits culture. Sure noone in their right mind would choose it and less so now, because services/housing/welfare are in the worst state we've seen for a long time - but right wing thinking really doesn't help people get support, have a roof and eat. Duncan, Szasz states, quite correctly in my opinion, that the term 'mental illness' is actually a metaphor. The 'mind' is not a physical entity and therefore cannot be subject to disease, i.e an observable objective measurement of a physical abnormality (unless one changes the definition of what the word 'disease' actually means). Which is what Szasz accuses psychiatry of doing without any scientific evidence. Szasz says that what many may call a 'mental illness' is merely medicalising a deviant behaviour. For example, is addiction a disease? 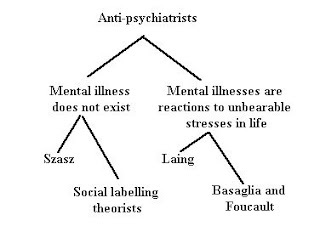 Szasz, therefore is on the same branch of thinking as Laing and not as you show in your diagram. What is called an 'illness' is actually a 'problem in living'. Szasz is also not an 'anti-psychiatrist' and has written extensively on this subject. He is only against imprisonment without trial and the legal definition of what is insanity. Dialogue between two consenting adults is ok.
Szasz is well aware of this fact and the problems that result. Are your thoughts on this matter due to a mental illness? Is misbehaviour a medical disease? Which is why 'mental illness' has increased exponentially over the past few years. Want to live off the state? Fake illness! Especially one that cannot be disproved! Unlike measles or cancer. Szasz may feature on a film but you cannot accuse him of things he does not actually say. Of course the Nazis viewed Jews as psychologically subhuman and therefore subject to annihilation for the good of the 'human race'. You do realise Szasz is a Hungarian Jew - yes? Sorry but you are ignorant of the facts. I would say you are stupid but maybe you can in your next comment redeem yourself? Of course I know he's a Jew. You refer to cancer yet in 2 recent TV exposé's in the UK they revealed how cancer patients are being denied state support on the basis of whether their chemotherapy is oral or IV. Others are denied support on the basis of whether they have an imaginary wheelchair or can move 1 finger. I'm amazed people in coma's are not being gainfully employed as paperweights. I know what you mean, anonymous. Szasz does not deny that the problems which are seen by others as 'mental illness' actually exist. However, he's critical of people, like Laing, that treat mental illness as though it exists. For example, he wasn't in favour of places like Kingsley Hall. Although he's not advocating treating mentally ill criminals inhumanely, he would not recognise an insanity defence. Of course I know he denies being an anti-psychiatrist. Interestingly, he calls Laing an anti-psychiatrist, even though he too denied the term of himself. I'm using 'anti-psychiatry' in the sense in which it is understood as the "anti-psychiatry movement", which psychiatry has now moved on from. Of course Laing was associated with David Cooper, who invented the term, but Laing admitted that although he enjoyed engaging with Cooper, he found many of his views embarrasing. I don't see distress as a disease entity and don't agree with forced treatment. What I object to is Szasz's right wing thinking, whether we like it or not we need a welfare state. I don't want to see anyone homeless or unable to eat because they're unable to work consistently enough to support themselves. it werry sure that if psychiatrists run like shamanist to evaluate human body symptoms..that's absolut paranoidism in they head..never in patient. And if any state allow schuch barbarism..its a state of human right violence..
Shamanistm must be banned and shamanism education..where shamans had listed all body pain in head to toe to be mark of mental ilness.. Must be bann..and all humiliation done before bann..must be compensate by state to pay like victims of any crime whot state officers educate like humiliate a body symptoms? Who ever psychiatrize a body pain of others are sadist personality and those who educate a psychiatry are leaders of sadist education..
All sadisim produse a homeland hate..and country who allow a psychiatrizin must no that ones psychiatrizin person does not never protect a borders of homeland..because psychiatrizin its crime and criminal homeland must not be defect. ?